HDTV Supplys WolfPack HDMI Over IP Network switch, together with the above optional HDMI extenders, operates as a Professional HDMI Extender, HDMI Splitter and HDMI Matrix Switcher depending upon your needs. Because it is a matrix switcher, it allows any input to be routed to any output; or the same input to be routed to all outputs, or any combination. It is controlled by a PC or MAC only via its LAN port with the supplied Browser Based GUI and a FIREFOX Browser. Our 120m HDMI Matrix Extender over IP is a device based on the standard TCP/IP protocol for transmitting HD audio and video source over LAN. It transmits your HD display with the high resolutions up to 120 meters away from your HDMI or DVI-D source by using one CAT5e/6 cable. At the same time, its also convenient to transmit HDMI audio and video source by point-to-point, point-to-many and many-to-many and a cascade connection mode. Note: For many to many application, please buy a 10-Gigabit switch with IGMP Multicast function with three layers protocol. 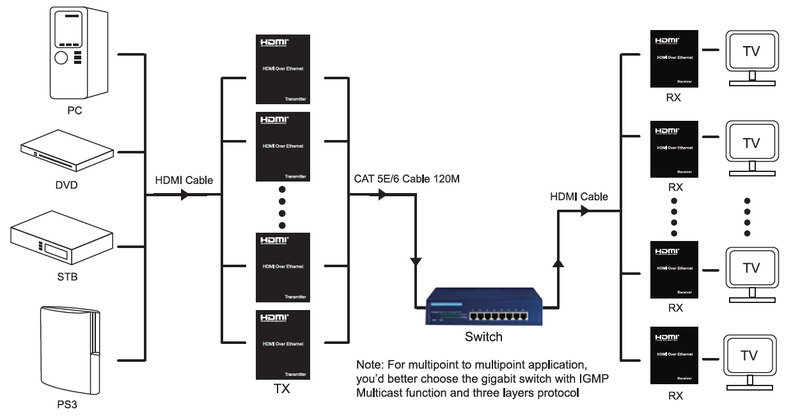 Support point-to-point mode, multipoint-to-multipoint mode and cascade connection mode. Support one way IR extension. All available LAN technology can be used to connect the Tx and the Rx; e.g., Ethernet, WLAN, Home PNA and EoC. With one low cost CAT-5/5e cable, you can readily extend HDMI sources from a DVD player, PS3, PC, and any other kind of sources compliant with HDMI and ™DS to distant display monitors including HDMI enabled TV sets or LCD PC monitors. The HDMI Over Ethernet allows you to simultaneously send out an HDMI 1.3 Signal (including 1080p video with 5.1 audio) to one or more HDMI video projectors or LCD Panels and return an IR control Signal to the source using CAT5/6/7 Cable over a standard Ethernet infrastructure. 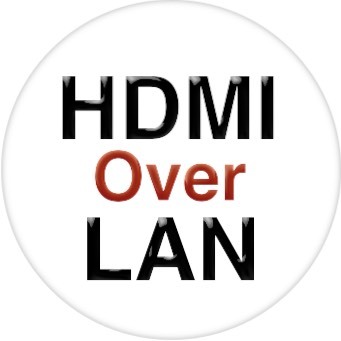 The HDMI Over Ethernet set can be used to distribute HD digital content from multiple Sources to up 200 remote distribute on a LAN by cascading Managed Ethernet switches up to 3 levels, allowing the display very far away from the 1080p source devices while sustaining picture & sound quality. Each device is installed using 1 piece of twisted pair cable. AV signals are transmitted digitally over the CAT5/6/7 cable without any signal loss. Internal JPEG video compression adapts to available network bandwidth if needed. The integrated Scaler function allows different input and output resolutions (different displays can be at different resolutions). The IR TX / RX function can be used to remotely control the HDMI source device from any receiver location. 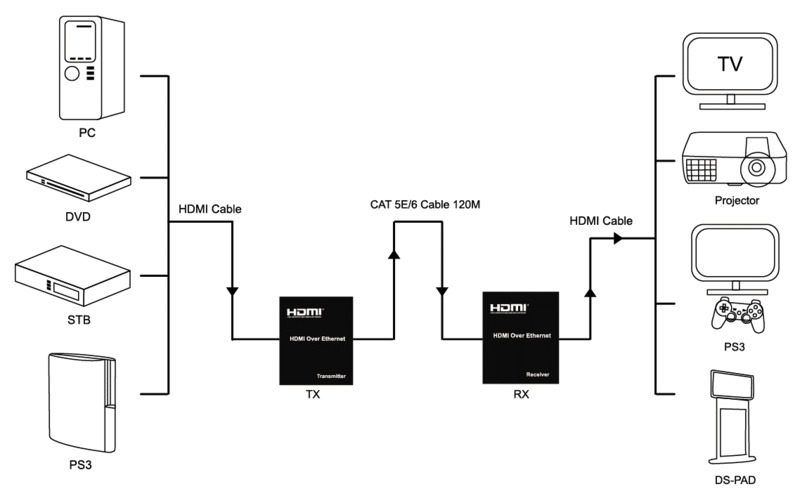 This cost effective flexibility makes HDCP compliant devices transmit high quality video and audio with longer distances when integrating several components apart. The transmitting unit is used to capture the input HDMI signals and carries the signals thru one RJ-45 connector into one low cost CAT-5/5e/6 cable. The receiving unit is responsible for equalizing the sent ™DS multimedia data. The transmission distance between the sending and receiving units can be up to 100 meters at 1080p. With equalization control switch on the receiving unit, users can adjust the equalization strength to the received ™DS signals, and therefore optimize the transmission distance between source and destination. Why not buy this HDMI Over Ethernet today? Many PC video card with HDMI outputs. Call your video card supplier to discuss your application or us.